The Fifty Best held a “blind” tasting of recent release sparkling wines from five countries with 15 pre-qualified wine judges. Strict tasting rules were applied. The order of service was established beforehand by lottery. 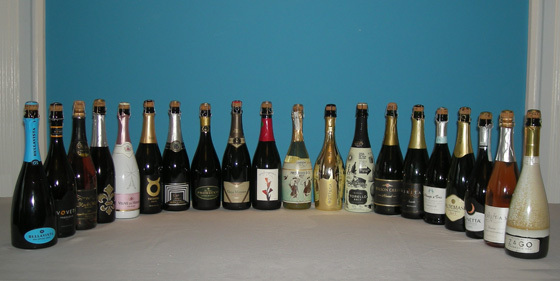 The flavored sparkling wine was tasted and scored separately. Each of the sparkling wines were poured into fresh glasses from new sealed bottles and served well chilled. Only ice water and peasant bread were available to cleanse the palate. This wine was made from 100% Chardonnay grapes by the traditional Champagne method (in which the second fermentation takes place in the bottle). Aroma: Bing cherry, sour cherry, subtle cherry, strawberry, berry, pomegranate, rhubarb, creamy banana, honeydew, watermelon rind, Jolly Rancher, rose petal, pink peppercorn, earthy, white stone. Palate: Tart red berries, strawberry, raspberry, sour cherry, ripe cherries, crab apple, watermelon, red grapes, blood orange, white citrus pith, rose, vanilla, almond, toasty, leather, tobacco, tannic grape skin, stone, high acidity, frothy. Finish: Strawberry, pomegranate, melon, toast, flavorful. This wine was made from a blend of organically grown Macabeu (50%) and Chardonnay (50%) grapes that were initially fermented in steel tanks with aging of 15 months for the second fermentation. Aroma: Bosc pear, melon, lemon, grapefruit, violet, faint sweet meadow, cream, butter, almond, yeast, chalk, mineral, steely, Riesling-like, crisp. Palate: Green apple, tart apple, ripe apple, pear, melon, cantaloupe, honey, lemon, lime, grapefruit, citrus, orange zest, lemon pith, almond, toasted biscuit, yeasty, dough, mineral, slate, flinty stone, medium intensity, medium acidity, balanced. Finish: Citrus, melon, biscuit, mineral, good acidity, very dry, flavorful. The grapes (65% Chardonnay, 35% Pinot Nero) for this wine hailed from picturesque vineyards in northern Italy (about half way between Milan and Verona), with 50% of the juice fermented in small white oak casks and 6 years of aging before release. Aroma: Granny Smith apple, apple, pear, stone fruit, lemon, grapefruit, citrus, sweet biscuit, dough, light mineral, earthy, bright. Palate: Green apple, apple, ripe pear, cherry, green grape, grapefruit, lemon, lemon peel, chamomile, sourdough, bread, nice minerality, very dry, fresh balanced acidity, bright acidity, elegant. Finish: Pear, dried apple chips, ginger, lemon zest, tangy, mineral, clean. This wine was made from 100% Chardonnay grapes harvested from Valle dei Laghi and the hills around the Trento area, with aging on its lees (wasted yeast) for over 15 months following fermentation. Aroma: Golden apple, light green apple, pear, citrus, lemon, lime, dried apricot, lilies, orchids, damp vegetal, almond, fresh-baked bread, butter, mineral, low intensity. Palate: Golden delicious apple, Granny Smith, Macintosh, crisp apple, un-ripe kiwi, blueberries, soft citrus, orange peel, white floral, creamy, custard, bitter almond, toast, green tea, salty mineral, steel, full body. Finish: Fuji apple, raspberry, citrus, lemon zest, tart, sweet grass, caramel, wood, mineral, high acidity. This wine was made from 100% Glera grapes by the “Charmat Method” (in which the second fermentation takes place in large stainless steel pressurized tanks). Aroma: Crisp green apple, pear, ripe cantaloupe, banana, citrus, lime, lemon peel, sugarcane, cactus, herb garden, bread, medium intensity, clean, crisp, fresh. Palate: Green apple, apple, pear, banana, melon, cantaloupe, cactus, mint, almonds, toast, Italian bread, creamy, white stone, high acidity, lovely mouthfeel, fine bubbles. Finish: Green apple, pear, smoky, balanced, refreshing. This wine was made from a blend of Xarel.lo (46%), Macabeu (30%) and Parellada (24%) grapes grown in the Can Marti area (in northeastern Spain). Each varietal was pressed separately, then blended and bottled with the second fermentation taking place in the bottle over 24 months. Aroma: Honey, banana, light pineapple, citrus, lemon peel, white pepper, black tea, fresh-baked bread, rich brioche, toasty, lanolin, chalky, mineral, good autolysis, medium intensity. Palate: Green apple, applesauce, pear, green grapes, clementine, ginger, licorice, mushroom, toast, crusty bread, oak, wood, creamy, buttery, oak, medium acidity, really nice mouthfeel, complex, round, easy. Finish: Lemon pith, walnut, tea, crisp, very dry, medium acidity, soft, mellow, slightly mouthwatering, amazing. The Glera grapes for this wine were from the Veneto area in the northeast of Italy, and were harvested in the early morning and processed by the “Charmat Method” (in which the second fermentation to create the bubbles takes place in large stainless steel pressurized tanks). Aroma: Apple, pear, stone fruit, lemon, kumquat, lemon verbena, honeycomb, light floral, fresh cut grass, subtle earthy, crisp, light. Palate: Sour apple, peach, pear, kumquat, lemon zest, nutty, mineral, chalk, biscuit, toasty, yeasty, hint of creaminess, slightly sweet, nice acidity, spritzy, tight bubbles. Finish: Pear, citrus, nutty, biscuit, yeasty, crisp, nice, dry. This wine was made from 100% Glera grapes that were nourished by spring water. The second fermentation to produce the bubbles was by the Charmat Method (in which the process takes place in stainless steel tanks). Aroma: Golden delicious apples, Bartlett pear, white grape juice, explosive tropical fruit, ripe banana, lemon-lime soda, white flowers, chamomile, rose water, soft floral. Palate: Pear, Bartlett pear, Bosc pear, apple, plum, ripe honeydew, citrus, orange, white grapefruit pith, white flowers, ginger, slight spice, soft round bread, doughy bread, bright acidity, great mouthfeel. Finish: Apple, dates, creamy, slightly tart, slight spice, wood, clean, fresh. For this wine, hand-picked Glera grapes from the Veneto area were vinified by the “Charmat Method” (in which the second fermentation to produce the bubbles takes place in a large stainless steel pressurized tank). Aroma: Ripe apple, Meyer lemon, grapefruit, melon, tropical fruit, banana, sweet cream, butter, lettuce, snap peas, forest floor, light, crisp. Palate: Apple, baked apple, golden apple, stone fruit, melon, unripe star fruit, raspberry, lemon, Meyer lemon, white grapefruit pith, soft citrus, candied fruit, sweet cream, almond, walnut, integrated acidity, nicely balanced, very dry, soft, enjoyable. Finish: Peach, orange peel, slight floral, walnut, dry, flavorful, graceful. This wine was made from a blend of Xarel.lo, Macabeo and Parellada grapes, and processed over 9 months by the traditional Champagne method (in which the second fermentation to produce the bubbles takes place in the bottle). This wine was made from 100% Glera grapes grown on hillside vineyards in the Veneto area that received cooling afternoon breezes. Aroma: Golden apple, elegant soft tropical fruit, faint citrus, floral, rose, nutty, slate, zesty, light, fresh. Palate: Ripe orchard fruit, apples, sweet tart pear, strawberry, kiwi, grapefruit, rose, almond, nuttiness, dough, bread, slate, frothy, fine bubbles. Finish: Grapefruit, sugar straws, almond paste, toast, slightly tart, subtle. To make this wine, grapes from the Glasear Vineyard in Yolo County were first fermented in stainless steel tanks and bottled, with the second fermentation taking place in the bottle to produce the bubbles. Aroma: Black cherry, pomegranate, crisp berries, strawberry, white cranberry, cantaloupe, watermelon, cherry blossom, rose, basil, white stone, medium intensity. Palate: Cherry, black cherry, ripe raspberries, strawberry, red plum, apple, red-skin pear, pink grapefruit, candied violet, creamy cocoa, cola, mint, crisp, high acidity, fizzy, lightly integrated flavors, light mouthfeel. Finish: Ripe raspberry, watermelon, mint, clean, well balanced. This wine was fashioned from a blend of Chardonnay and Cabernet Franc grapes that were processed by the traditional Champagne method (in which the second fermentation to produce the bubbles takes place in the bottle). Aroma: Sweet apples, passion fruit, banana, melon, lemon, orange blossom, floral, biscuit, yeasty, butter, cream, crème brulee, nuts, earthy, wet stones, slate, crisp, effervescent. Palate: Pear, apple, white peach, melon, lime, citrus, lemon rind, herbaceous, cashews, cream biscuit, yeasty, oaky edge, barrel, foamy, fizzy, complex, balanced, medium acidity, nice balance between sweet and dry, soft, easy, crémant-like, elegant. Finish: Malty apple, lemon, lime, creamy, flavorful, well balanced, integrated, nice, beautiful. This sparkler was produced from a blend of Syrah, Cinsault and Grenache grapes grown in Bordeaux. Aroma: Strawberry, cranberry, pomegranate, red plum, grape seed oil, grilled watermelon, mushroom, bready, metallic, medium intensity. Palate: Ripe red berries, raspberry, ripe strawberry, stewed cranberry, cherry, red currants, plum, red plum, melon, pear, orange, lemon peel, mint, rose perfume, violet, soft, creamy, slightly sweet. Finish: Strawberry, orange peel, floral, sweet almond, baklava, smoky, full-flavored. Made from 100% carefully selected Glera grapes from within and just outside the Valdobbiadene area, this wine underwent a 60 day secondary fermentation in a small autoclave. Aroma: Pear, Asian pear, red apple, apple, white grapefruit, honeydew, lychee, cider, candy cane, sweet clover, tropical breeze, slate, medium intensity, yeast autolysis, elegant. Palate: Golden apple, McIntosh apple, green apple, pear, pineapple, guava, green grapes, grapefruit, lime, citrus peel, lemon zest, white flowers, honeysuckle, toast, mid-acidity, effervescent, crisp, bright, zippy. Finish: Apple, pear, lemon, citrus, cider, dry, clean, pleasant. This wine was produced by the “Charmat Method” (in which the second fermentation takes place in large pressurized stainless steel tanks) from hand-harvested Glera grapes grown in the Valdobbiadene area (between Verona and Venice). Aroma: Ripe orchard fruit, red apple, citrus, honeydew, tutti fruti juice punch, sweet jam, cotton candy, candied sugar, lilac, violet, pink rose petal, light grassiness, almonds, sweet truffle. Palate: Delicate white peach, peach, green apple, raspberry, red plum, pomegranate, citrus, Juicy Fruit gum, honey, almonds, mint, yeast, stony mineral, bright, crisp, slightly tart, medium acidity, luscious mouthfeel. Finish: Clementine, truffle, soft floral, tart, soft, gentle. Cuvée Leonora Brut Alta Langa D.O.C.G. Made from hand-harvested grapes (70% Pinot Nero, 30% Chardonnay) grown in the province of Alexandria, this wine was processed with the first fermentation in steel tanks and the second in the bottle, on its lees (wasted yeast) for 30 months. Aroma: Sliced apple, sour apple, apple, pear, melon, white grape, very light lemon, lemon zest, white floral, meringue. Palate: Sweet Roma apple, golden apple, apple, pear, lemon, honeydew, herbaceous, bitter herbs, clover, light cream, oak, earthy, stone, steel, low acidity, nice complexity, soft, smooth, balanced. Finish: Lemon, cider, hint of toast, medium acidity, clean, easy, mellow, pleasant. This wine was made from 100% Glera grapes grown in the Valdobbiadene Region and processed by the Charmat Method (in which the second fermentation takes place in large, pressurized stainless steel tanks). Aroma: Stone fruit, pear, grape, orange, cantaloupe, fruit-roll lollypop, cherry blossom, subtle floral, grape seed oil, oak, low intensity. Palate: Pear, apple, peach, raspberry, strawberry, grape, kiwi, orange, sweet banana, ripe melon, white flowers, medium acidity. Finish: Apple cider, pear, orange, sweet. Aroma: Toffee, buttery, honey, Bosc pear, apricot, apple, golden apple, lemon, cucumber, asparagus, hay, bread, minerality, smoke, medium intensity. Palate: Apple, green apple, Anjou pear, under-ripe pear, citrus, lemon rind, bitter lemon, nutty, dough, toast, biscuit, buttery, light oak, flinty, dirt, soil, volcanic ash, clay, chalky, steeliness, mineral, very dry, crisp, tart, intense. Finish: Apple, pear, white peach, honey, mineral, chalk, yeasty, flinty, smoky, dry. This sparkling wine is naturally fermented from a blend of French Colombard and Chardonnay grapes with a small amount of pure almond extract added. Aroma: Apple, red cherry, strawberry, Juicy Fruit, sweet candy, sweet almond icing, eggnog, nutty, almond, almond milk soap, marzipan, anise, licorice, intense. Palate: Ripe red cherry, pear, Juicy Fruit, grenadine, caramel, honeysuckle, almond, dough, anise, cinnamon, clean fizz. Finish: Strawberry, bubblegum, citrus, almond, almond extract, anise, pleasing.